This point is focused in the industrial applications of composting, that is where the lack of knowledge about the process is one of the key factors in the success or failure of the facility. We will not talk about the home composting. There are many successful experiences around the world where they usually recover the old agricultural techniques to produce compost already explained. Sophistication and evolution of the composting methods of Beltsville and Rutgers, along with the development of specific machinery for the process, like the turners, allowed to create a range of composting systems. They are classified in relation to two aspects or characteristics: the isolation level with respect to the outside; and if there are turnings or mixings of the material during the process. It is an artificial form of classification like many others, but attends the need to can compare and to put into groups the different composting models that can be found actually. 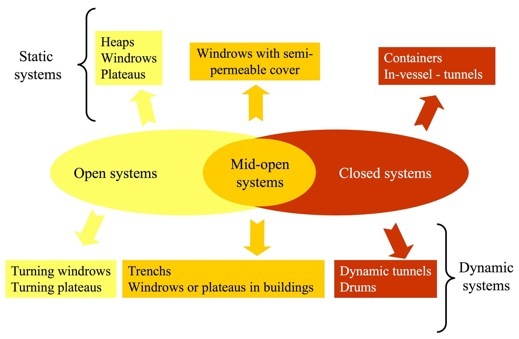 Open systems, where the process is realized at the open air (although facilities under cover can be easily found in areas with high rainfall). Mid-open systems, where the process is realized in closed premises that have some system to capture and send the gases to a depuration system, generally a biofilter. Closed systems, where the process is realized in hermetic enclosures, put under an exhaustive control of parameters, and with conduction of all the gases to a cleaning and depuration system. Static systems, where once the windrow is made it is not moved until the end of the process, or until the dwell time in an area of the facility is over. Dynamic systems, where turnings or movements of the material are realised.